Milele Lodge i Zanzibar, Tanzania: Bestill nå! Kae Zanland's bungalow is built using traditional techniques and materials, such as local coral stone, wood and palm leaves. The design is also inspired by the local way of building with an open and welcoming interior structure. It has four rooms out of which one is self contained and the other three share the bathroom. The bedrooms are equipped with double bed, bed linen, a fan and mosquito net. 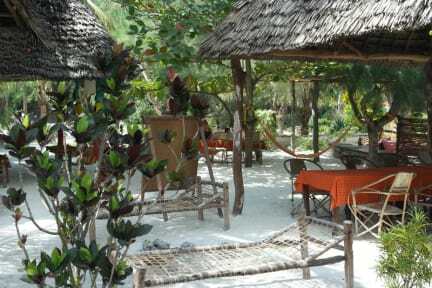 Kae Zanland Lodge is situated in Michamvi Kae which is a peaceful hideaway at the Eastern coast of Zanzibar Island. 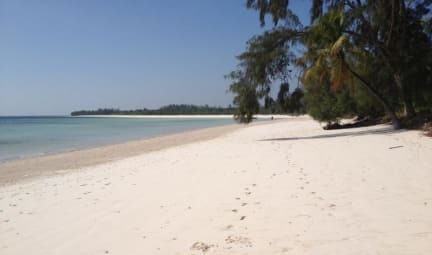 Michamvi Kae has a beautiful white beach and the warm waves of the Indian Ocean. Our bungalow lies a few steps walk from the beach. The best of diving and snorkelling can be found in the area. Excursions are easily arranged to various places, such as the mangroves and Zanzibar's only remaining tropical forest, with a sprawling bird and animal life.